What bird is this that Warner saw? Vote in the comments because I can’t figure out how to insert a poll! Why not a bigger play structure with built-in synthetic safety surfacing? Because of the size of play structure and required safety surfacing, play equipment would have significantly reduced habitat for species, which the committee sought both for benefits to our kids, as well as to our community (we have intentionally planted native butterfly habitat in the Children’s Play Area and kids are introduced to several species of butterflies, other insects like ladybugs and their larvae, and earthworms — kids have even photographed and video-recorded Black Swallowtail butterflies making their chrysalises on 2 occasions!). In addition, the required safety surfacing would have likely required us to cut down the large tree that dominates the play area, eliminating natural shade and visual beauty. Ok, so no huge play structures, but why not synthetic, permeable safety surfacing? It might have required less maintenance (hard to know), but in addition to habitat value, we thought there might be some benefits in terms of soil quality from bringing in mulch. We tested our soil, and although all our tests from the backyard came back under NY standards, soil lead was elevated from background levels (as it is throughout NYC and other urban areas); we learned that bringing in healthier soil, compost and mulch could help improve our soil quality (when the mulch decomposes, it creates new soil), and potentially make lead and other toxins in our soil less available to people and the broader environment, though that’s harder to know. We have plenty of trees in CV and if the soil is a problem, why not just put in as much synthetic stuff as possible? Increasing impermeable surfaces (like playground equipment and most safety surfacing) means more runoff into NYC’s combined sewer system. During large rainfall events, the system is overwhelmed and sewer waste combines with stormwater to flow untreated into the East River. By improving our soil and being thoughtful about what we plant, we may also increase our soil’s ability to capture stormwater flow and reduce demands on NYCs stormwater system. Grass and soil don’t work as safety surfacing (too hard! ), and when you plant native plants and add mulch, you may actually improve the ability of soil to allow for the infiltration of rainfall. I’d love to create an actual rain garden or bioswale . . . but that takes more careful planning and money . . . but maybe? Someday? Maybe kids could even help with design and implementation. At this point, my kids and I aren’t out in the backyard as much as we used to be, and my kids pretty much refuse to garden with me, especially now that they are entering their teen and preeteen years. But they spent many happy years as toddlers, preschoolers, and early elementary schoolers looking for earthworms and seeking butterfly eggs, larvae, and chrysalises. My daughter did a science fair project in second grade trying to determine when birds were more likely to be in the play area — early morning or later afternoon (before or after school, basically). We’ve found an impressive patch of four-leaf clovers, picked them with friends and pressed them for posterity. There are lots of other things they’ve liked about the backyard over the years, but the small ways in which it has allowed them a means to interact with their natural environment in the heart of NYC have felt particularly special. The happy girl who discovered the caterpillar right before it formed its chrysalis!. At long last the watering schedule is updated for 2016. Sign up online now — choose as many days as you can; the schedule gives some instructions; generally, just know that it’s better to water early or later in the day (not mid-day), just because more water will soak in. It’s a great way to help out, and an easy commitment . . . and we have some open slots this weekend, so if you’re around for the holiday weekend, please help! Tomato (and Other!) Seedlings — Come One, Come All!! It’s time! If you have tomato (or other) seedlings that we planted at the February seedling event that you’d like to transplant into the Children’s Play Area Garden, your seedlings need to come out and be COUNTED! That’s right, we need to make sure we have the space we need. Please bring your seedlings out to the garden and leave them under the flower pockets, inside the garden along the green fence. And please also post a comment in response to this post here on the blog about what and how much you’ve brought out (I believe you can post comments as a guest if you’re not a WordPress member). The weather is warm enough that you can leave them outside, so no worries there. Thanks, and looking forward to some transplanting in the next week! A little more grass by the slides! A couple of years back, parents got together and installed our in-ground slide in a “swarm build.” See a slide show of the event! Wear and tear — both from kids’ feet and hillside slope and gravity make keeping grass and soil by the edges of the slide a little challenging. We put down a little more topsoil, added some grass seeds, and threw on some straw mulch this morning — both to make it look better and to help make sure the slide stays stable. 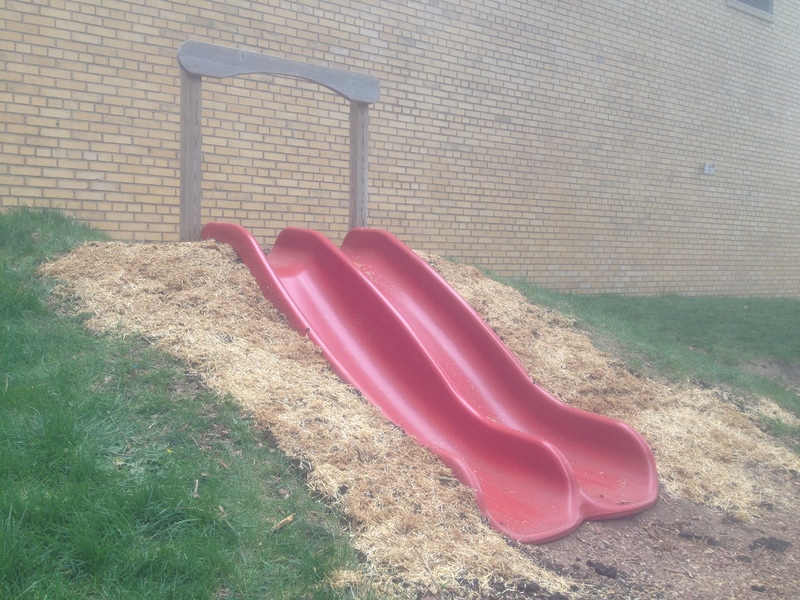 It will be a challenge, but if kids can be convinced to not take the fastest route up, and instead use the wood chip mulch path off to the east of the slides, that will help our grass grow. Fingers crossed! So I failed to plant anything before the 15th –just ran out of time! Poll results were pretty even — including some offline entries, mustard greens, beets, and lettuce/arugula seem to be winners. I was planning to try to plant all of those when we’re back in town September 2d, even though it’s a little late, and hope the cover we have for that bed can be successfully re-installed and extend our season by a few weeks. It’s always an experiment. Unless someone else has already done it, we’ll probably also pull out the petunias in the hanging pockets and replace with greens of some sort for the fall. Want to help or harvest/plant on (or before!) the 2d? Just let me know in the comments section — we’d welcome some new planters, if you’re interested! Vote! What Should We Plant This Week? It’s time to harvest the rest of our lettuce and carrots from the smaller northeast corner bed (it’s finally hot enough that the lettuces are bolting) and plant something new. Click on the pic above to see the full NYC Urban Planting Calendar! You can vote more than once, but let’s be fair: if you do vote multiple times, let us know in the comment section! We’ll tally the votes no later than Wednesday so we can plant this week! Just a snapshot (or several) of what’s growing now in the garden. The snap pea vines finally went down — it’s amazing that they were still producing even some flowers/peas this late in what is usually hot July. Soon the cucumbers we planted back at the very beginning of this month should take over the trellises. 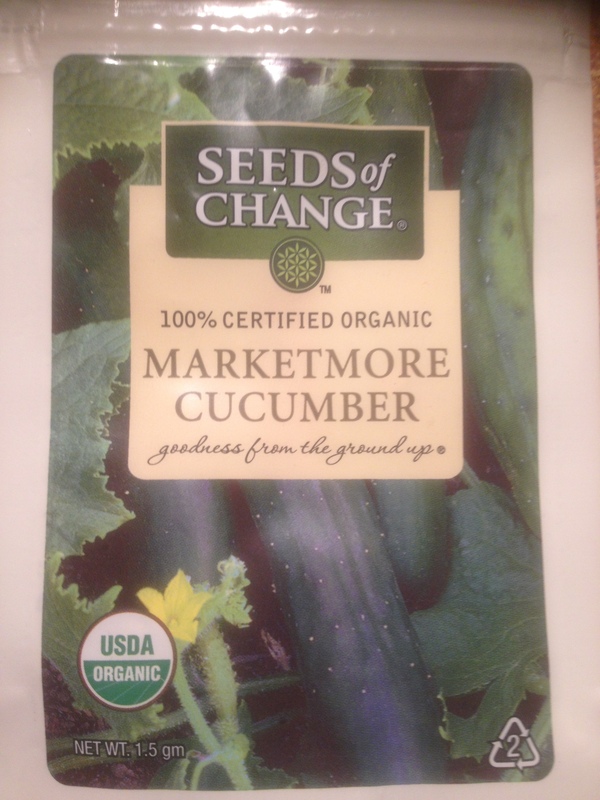 Fingers crossed for cucumbers in late August and September! It’s a little late (the cucumber seeds should have gone in in June), but a cool-ish spring/early summer means that the snap peas are only now starting to die (you can see them turning brown up from the bottom), so I’m hoping it will be good timing for the cucumbers to come up and take over the trellises when we’re ready to pull off the remains of the snap peas. Thanks to Warner and Frankie for helping plant! Everyone joins me. I run, I jump. We play long and short. We play a game. It’s fun. We play together. Hide and seek. Tug and more. Boom! I fell. My friends help me. I’m happy. Everyone goes inside. I stay out. It greets me. I had a great time. Let’s just say I like this one more than “Ode to my TV”.